At one level, even though the movie is titledThe Pursuit of Happyness (deliberately spelt wrong), it is pretty depressing. Yes, the movie is supposed to focus on the struggles of the main protagonist as he chases what seems like a chimerical dream. However, every time you think that things are gonna get better, they only get even worse for Chris. As Chris and his son move from one slump to another, you begin to wonder is there truly light at the end of the tunnel for this man? The movie starts off with Chris desperately trying to sell, with not too much luck, a bone density monitoring system. Every hospital he approaches does not seem to find a need for such a system. But at different stages in the movie, I did find it strange that, when things start going really really wrong, and when you know he needs to dig deep to find a way out, Chris does manage to sell that very system to different doctors, even as he is trying to do his best at an unpaid internship at Dean Whitter brokerage firm, and also struggling to find a place to stay at night for himself and his son. So, initially, couldn't he sell it because he didn't try hard enough or because he knew that even if he didn't sell it there was a way out with his wife doing two shifts at work? It seems even weirder because the movie seems to focus on the strength of trying despite failures, on Chris' unwavering perseverance and determination. Two scenes in the movie actually reflect this very well: first, when Chris gets a chance to impress his future employer, in 10 to 20 minutes on a cab ride. As the cab races to the destination, Chris struggles with the Rubik's cube, turning it round and round desperately. The urgency in his moves is well-captured, for he knows he had to get it right, for this journey on the cab could well be a ticket to the journey of his life itself. To me that scene in the cab summed up the movie - try, try and try again. You have to determine all the moves for yourself and you have to get it right. That is how one pursues happiness, and Chris' life is a testimony to that. All this is voiced in one way or other when Chris talks to his son in the movie. In one scene when Chris is playing basketball with his son, he says he never made it as a basketball player and his son wouldn't make it too. And just immediately after, he tells the kid, "Don't ever let someone tell you, you can't do something. Not even me." Or at another time he says, "You got a dream, you gotta protect it. People can't do something themselves, they wanna tell you that you can't do it. You want something? Go get it. Gardner". And that's what Chris does - he gets out there, works himself out and makes it - really makes it, giving hope to a lot of others like him. I also found a lot of similarities between The Pursuit of Happyness and the Indian flick Guru. Even if they seem to be set in times separated by decades and in locations separated by the seven seas, at one level both Chris Gardner and Gurukant Desai are about the same thing - about breaking the shackles of poverty, about pursuing one's dreams, about making a lot of money, and about succeeding in life. In one of the early scenes in the Indian movie, his father tells Guru to be realistic, to stop chasing dreams because dreams never become a reality. There is a context to this statement - Guru's father believes so because he himself had never succeeded when he acted on his own ambitions and dreams, and hence he believes no one can. Something very similar to what Chris' says in the movie - "People can't do something themselves, they wanna tell you that you can't do it." Chris breaks law too even though they may seem minor in comparison to what Guru does - not paying his tickets, not paying the cab driver, sleeping in public toilets etc. But what redeems this man is his extreme love for his son - that indeed is one of the most touching dimensions of the movie. In both the movies though there is one aspect that just doesn't seem to work for me - for both Chris and Guru the pursuit of happiness is in making it, success was in building business empires, in becoming multi-millionaires. While I understand that without money to cover the basic needs in life, happiness is indeed elusive, this all out emphasis on money and more money is something I can't relate to. But then that is me. 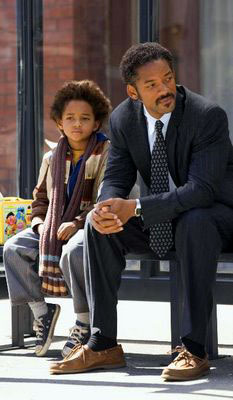 Even though it is painful to watch, The Pursuit of Happyness is worth a dekko. You will get out of the theatre feeling good and hopeful.